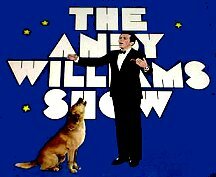 The Andy Williams Show was broadcast on a weekly basis from 1962 to 1967. 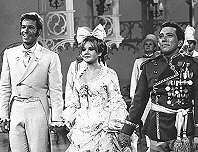 During the 1967-68 and 1968-69 seasons, the number of shows was reduced to three specials per year. 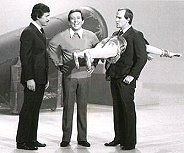 In 1969, the weekly format returned, and it remained a weekly show until leaving the airwaves in 1971. Comedy sketches, guest stars and a large cast of regular perfomers rounded out each telecast. Every year, TV audiences looked forward to the Christmas episodes, in which the entire Williams clan made an appearance. made many appearances on Andy's show. In 1969, after two seasons of occasional TV specials, the show returned to a weekly format. This time, the look was contemporary: a futuristic set, psychedelic lighting and a guest list that included more rock & roll acts. The audience sat on movable platforms that followed Andy around throughout the show. New segments were introduced, including The Informal Spot and The Williams Weirdos. The Weirdos were nutty characters portrayed by actors in costume: The Little General (Joe Seiter), Walking Suitcase (Ray Reese), Big Bird and Cookie Bear (Janos Prohaska). Cookie Bear loved to come onstage just as Andy was about to sing "Moon River" and ask for a cookie. Andy would get all mad and say, "No cookie...not now...not ever...NEVER!" Dejected, Cookie Bear would sadly wander offstage. Legend has it that the Cookie Bear sketch lent its name to a computer prank that was popular in the early 1970s. Talented hackers would program a computer to periodically suspend all activites and type out WANT A COOKIE. All efforts to reboot the system would fail, until someone actually typed the word COOKIE on the keyboard. All operations would then resume where they had left off. Legend also has it that this is where internet cookies got their name. 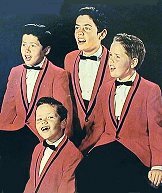 The Osmond Brothers (Alan, Jay, Merrill and Wayne) were performing at Disneyland when Andy Williams discovered them. 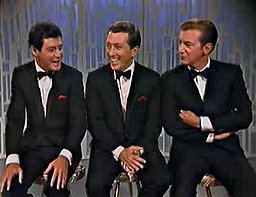 Billed as "a youthful barbershop harmony group from Ogden, Utah," they made their first appearance on Andy's show on December 20, 1962. Six-year-old Donny joined the show in 1963, and even four-year-old Marie made a guest appearance. The Osmonds stayed on the show for the entire length of its run, and America truly watched them grow up. Cuddle Up With Claudine Longet! 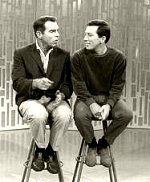 12/31/63--"Andy Williams New Years Eve Special"
3/17/64--"Andy Williams St. Patrick's Day Special"
5/4/69--"Andy Williams Magic Lantern Show Company"